Estonian flag carrier Nordica will add two Bombardier CRJ900 regional jets to its current fleet of six CRJ900s and two CRJ700s. The airline says the airframes will be leased from Transpordi Varahaldus (TVH), an Estonian state-run holding company which invests into the country’s transportation sector. Nordica will issue 25 million euros’ worth in bonds with eight-year maturity to finance the deal. The bonds will be bought in equal shares by two Estonian entities: privately owned banking operation LHV Pank and the namesake pension fund owned by that bank. The transaction is the biggest insertion of commercial capital into Estonian aviation in the country’s post-Soviet history. Four out of Nordica’s current six CRJ900s are owned by TVH. The Estonian airline has been gradually expanding its operations and becoming more active in supporting its strategic partner LOT Polish Airlines. The Polish carrier first struck up a partnership with the Estonian airline in November 2016. The strategic cooperation involves a common commercial platform and a shared ticket sales system. All flights are operated under the LOT code. 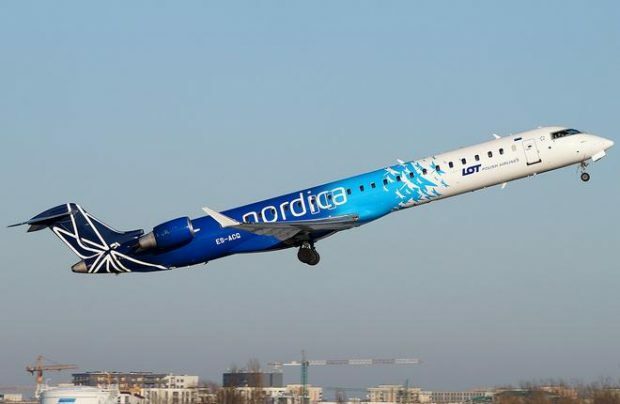 Nordica sources say one of the two new 90-sea CRJ900s will be put on the carrier’s own routes, whereas the other will be used to serve LOT flights. Nordica is to receive the two aircraft in June and July 2017. The airliners, both understood to have been built in 2011 to the same specifications as the airline’s current examples of the type, will start revenue services in early August.